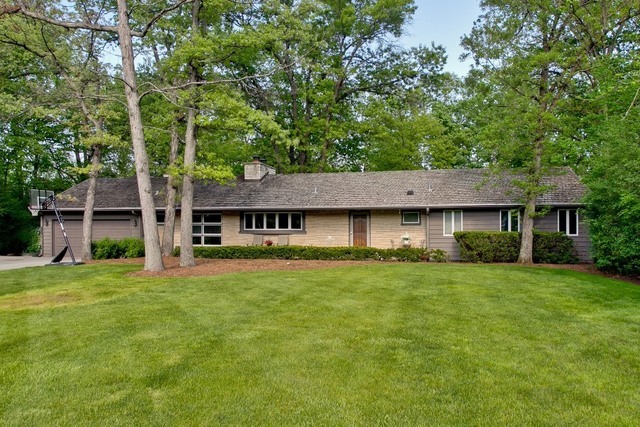 Nestled among towering trees on nearly an acre of land this sprawling ranch in Oak Grove School District will knock your socks off!Gleaming hardwood flooring. Crown molding. Recessed and designer lighting. Fabulously appointed gourmet kitchen with an abundance of cabinetry, granite counters and back splash, top of the line stainless steel appliances, eating area. Sun-drenched living room includes a wall of windows overlooking the backyard retreat, dual sided stone fireplace and is open to the dining room. The vaulted family room with an array of windows overlooking the yard, a dramatic brick fireplace and features access to the exterior and basement. Master bedroom offers a private bathroom. Three additional bedrooms and a full bathroom complete the main level. The finished basement includes an additional fireplace. Enjoy the outdoors on deck overlooking the in-ground pool and manicured yard; its the perfect backyard retreat! Finished garage with storage.